It’s now time to have a look at the two glamour domains of the last decade. Banking and Finance, and Consulting. 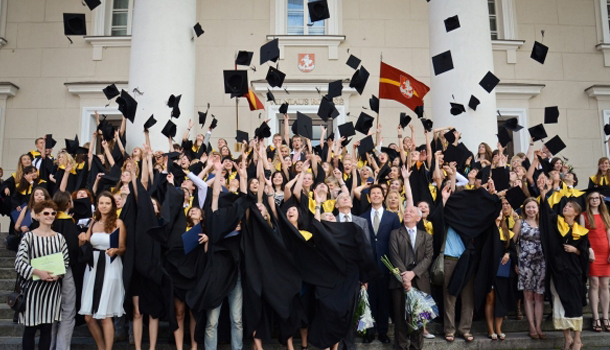 They have held a mysterious sway over the minds of MBA grads. We do believe things are changing though – in our recruitment survey last year, most MBA respondents chose sales and marketing as their most preferred domain. Surely, the banking boom is a thing of the past, and things will probably never be the same again. The number of available global front-end roles at top investment banks is a fraction of what it was prior to 2008. People are slowly realizing it. Slowly is the operative word. Many students anyway got unwittingly sucked into the vortex of finance, and took up middle-office ppt-making roles at these investment banks. On the other hand, consulting companies, which offer a slightly lower salary (compared to front-end finance roles) and better work (ppt-making and some additional perks – speaking to top management), have actually grown in popularity over the last few years. Again, consulting is a tertiary service like the advisory services provided by investment banks, and perhaps, the best and brightest of Indian B-schools can do better than spouting management jargon with practised ease. Our point is this – there is little innovative work done by banking and consulting firms, however, these firms still attract some of India’s brightest talent (see the dream companies in our recruitment survey for evidence). Most of the queries in our InsideIIM Helpline are about consulting and front-end investment banking. “Is my profile good for an interview shortlist with McKinsey, BCG, Bain?”. Is my profile a good fit for front-end IB? And from their responses in our conversation, it was amply clear that they did not have the slightest clue about either investment banking or consulting. So here we go, taking a look at the state of alumni at the most sought-after banking and consulting firms. The sector has been decimated, business-wise, since the great recession of 2008. However, students generally tend to follow the curve, rather than stay ahead of it. Therefore, there is a lag between the change in direction of an industry, and the response of students and their aspirations. The “behind-the-curve” demand for banking and finance has been absorbed by middle-office roles, while at other places, this demand has shifted towards consulting. All data from batches from 1997 to 2014. All caveats in our earlier articles continue to apply here. It is no secret that banks are very selective about roles offered at various campuses – and the best front-end roles are the exclusive preserve of the older IIMs (read A, B, C). Some of that data may be obscured by the results above, because the reflect all types of roles in these banks – front end investment banking, corporate banking, equity research etc. IIM Lucknow has not been able to make inroads as effectively as it has done in consulting. – IIM C is often spoken of as a dream campus for finance, and it is not hard to see why. IIM Calcutta stands out because of its alumni base in Deutsche Bank, Morgan Stanley, Citibank, Bank of America/Merrill Lynch, JP Morgan, Standard Chartered, HSBC, Barclays, UBS, Credit Suisse, Royal Bank of Scotland, American Express and DBS. That’s practically the whole list of top recruiters. – IIM Bangalore has a better presence in Goldman Sachs, but that could also be due to the proximity of the Goldman Sachs Bangalore office which offers middle-office roles. – Difficult to join Morgan Stanley, UBS, Credit Suisse and some other names if you are in the newer IIMs (L, I, and K). – A lot of the banks have capitalized on the demand for finance roles at the newer IIMs by offering middle office roles (prominent names include Deutsche Bank, Goldman Sachs, JP Morgan and HSBC). – Some banks like Standard Chartered offer transaction banking roles, and have hired in big numbers across all IIMs. The International Graduate program from Standard Chartered is offered at the newer IIMs as well. 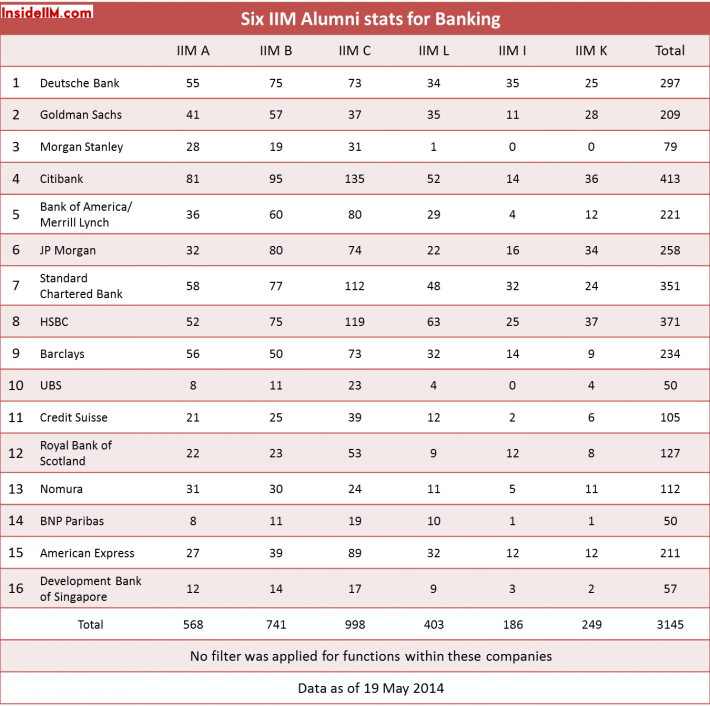 – IIM L is slightly better off compared to IIM I and IIM K for banking opportunities, but this seems to be largely due to the larger alumni base rather than any serious inroads made into the dominant position of the older IIMs. – Between IIM I and IIM K, IIM I has a bigger presence in Deutsche Bank, Standard Chartered, Barclays, and RBS, while IIM K has a larger presence at Goldman Sachs, JP Morgan, Bank of America/Merrill Lynch, Citibank, HSBC, UBS, Credit Suisse, and Nomura. – Until a few years ago, BCG, McKinsey and Bain went to only IIM A, B and C. While BCG and McKinsey now go to IIM Lucknow, ( and BCG goes to IIM Indore as well), McKinsey conducts a batch day process for the other IIMs (I and K). Bain does not hire from the other three older IIMs. If you want a good shot at BCG, McKinsey and Bain, you need to be at one of the three older IIMs. You can have a decent shot at BCG and McKinsey from IIM Lucknow, and BCG from IIM Indore, but beyond that its practically impossible. Among the three firms, BCG seems to have a special preference for IIM Bangalore, while McKinsey and Bain seem to have a special preference for IIM Ahmedabad. – AT Kearney is another top consult that hires exclusively from IIM A, B, C (and recently started hiring from) IIM L. Also joining this group of exclusive recruiters are AD Little, Oliver Wyman and Alvarez & Marsal. – Deloitte, Accenture and IBM are the most egalitarian recruiters, picking up the largest number of students from the greatest number of batches. We do know that a number of these roles are IT and process consulting roles, and not pure strategy consulting roles. – The big four of EY, KPMG, PwC and Deloitte are quite well distributed across B schools, and the difference in numbers may be down to historical reasons (newer IIMs – IIM L, I, and K may have enrolled these companies as recruiters more recently, and these companies, by and large, do not distinguish between campuses while hiring). – Booz & Co was sold to PwC. – Unsurprisingly, IIM A, B and C are definitely a cut above the rest for consulting roles, specifically for BCG, McKinsey, Bain, AT Kearney, AD Little, Oliver Wyman and Alvarez and Marsal. – IIM Lucknow is definitely closing in on these big consulting names, having made significant inroads into BCG, McKinsey and AT Kearney. – You do stand a decent chance of making it into Deloitte, IBM, and KPMG, EY and PwC from any of the six IIMs. – IIM I is stronger than IIM K for BCG, McKinsey and PwC, while the latter is stronger than IIM I for Deloitte, IBM and KPMG. Read the InsideIIM Recruitment Surveys for 2013 and 2012 here. You should have included ISB,Hyderabad in the list. It is founded by the Chairman, Mckinsey & Co. 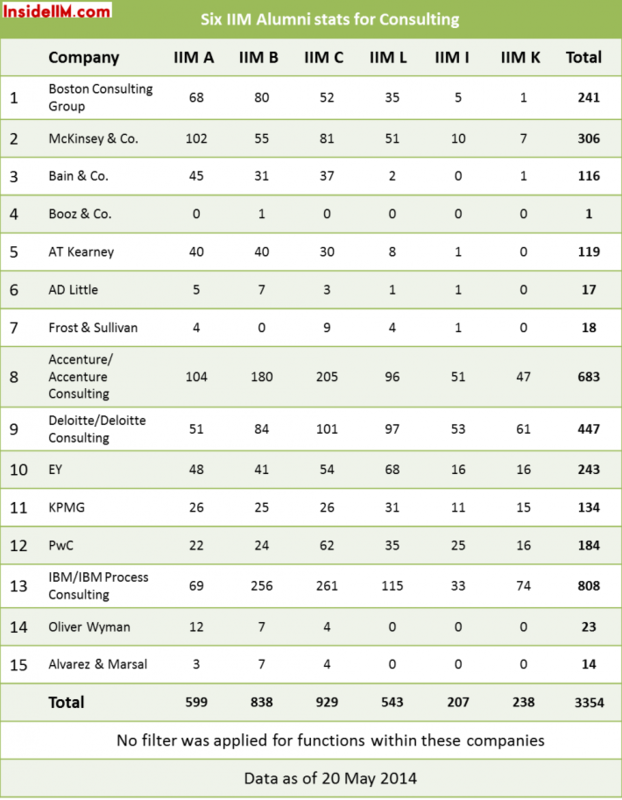 Almost all top consulting companies recruit every year from ISB. Hi arvind, ISB will be included in the next phase of our reports which focuses on non-IIM schools. Can I humbly request for an insightful article which distinguishes the various domains in consulting (management, process, IT etc..) ?